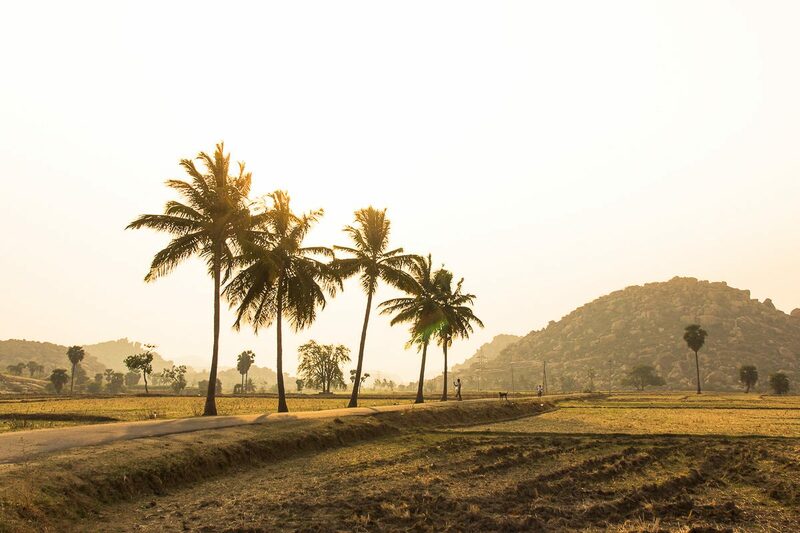 Hampi is a mysterious but beautiful village, a place that is well worth the journey. While Hampi is recognized as a UNESCO World Heritage Site, it is not overcrowded, it is rather peaceful. The village is split into two by a small river. One side of the river is home to some beautiful temples (the UNESCO World Heritage Site), has a small bazar and some restaurants, the other side of the river, also known as Hampi’s Hippie island, is backpackers paradise. 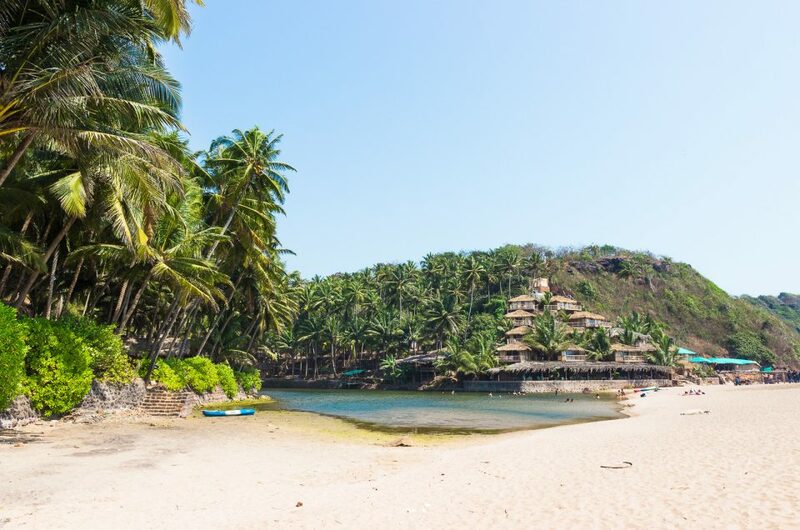 Imagine endless green fields, the most stunning viewpoints, places to go swimming and to go exploring… or simply enjoy the delicious Indian food and admire the view over the river. 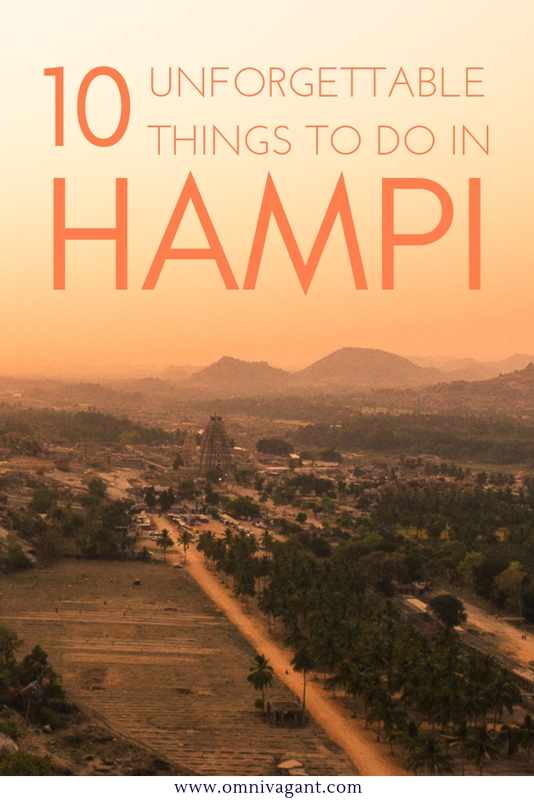 There is something to do in Hampi for everyone, so keep on reading to find out which 10 things to do in Hampi you should add to your South India bucket list! Hampi is located in the state of Karnataka in South India. Hampi can be reached from both Goa, Mysore and Bangalore by train or bus. However, there is no train station in Hampi itself, instead you will have to make your way to the nearest city, Hosapete, located roughly 30min out of Hampi. From Hosapete you can take either the local bus or a tuktuk to Hampi. Before going to Hampi, however, be sure to take some cash out as there are no ATMs in Hampi, at least not back in 2017. 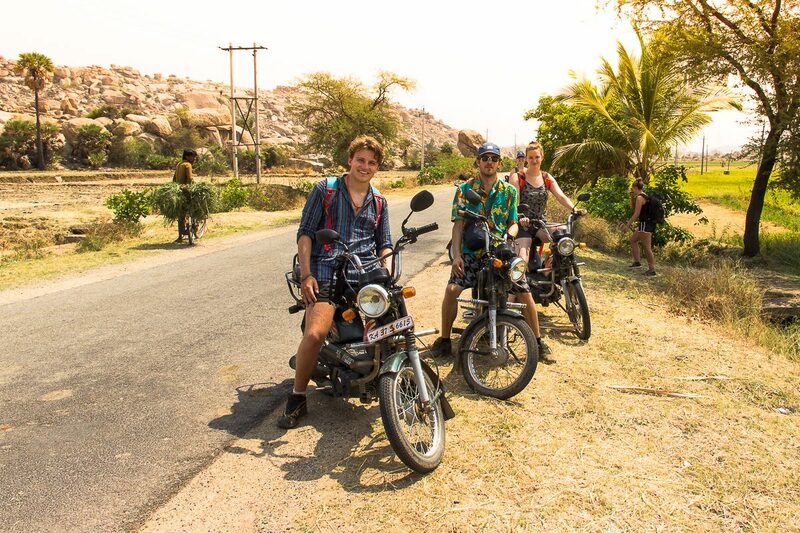 They will most likely drop you off around the bazaar, from here it is advised to make your way across the river and to find a place to stay on Hampi’s Hippie island, as this is where all the travelers and backpackers are located. While there are hostels near the bazaar, many travelers prefer not to stay here due to the fact that alcohol is forbidden on that side of the river. To give you a better idea of where Hampi is located check out the map below. The Hanuman Temple, located on the top of Anjaneya Hill, must be on your list when visiting Hampi. The viewpoint, where the Hanuman Temple is located, is “easily” reachable by steps. On the top you will find the most impeccable views, and many monkeys! While the monkeys look very cute, make sure not to come to close and protect your belongings, the monkeys are known for stealing anything they can get their hands on. So when you have secured your belongings just sit back and enjoy the spectacular view: banana plantations, rice paddies and other hills can be seen from the top. Anjaneya Hill, however, is located slightly out of town. The easiest way to get there would be to rent a motorbike or moped and drive there yourself. Don’t forget to take your shoes off when you reach the top, in the end you are at a temple. The best time to visit would be during sunrise or sunset, as this will give you an impeccable 360 degree view over the area of Hampi. It is no secret that the surroundings of Hampi, and especially Hampi’s Hippie island are simply mesmerizing. And while the viewpoints may be the highlight of many travelers their trip to Hampi, the lower areas shouldn’t be forgotten. Imagine banana plantations and rice fields as far as the eye can see, turning a corner to find more around the next hill. The rice fields vary from a deep yellow to green, if you are lucky and visiting in the right season, creating magical colored landscapes. 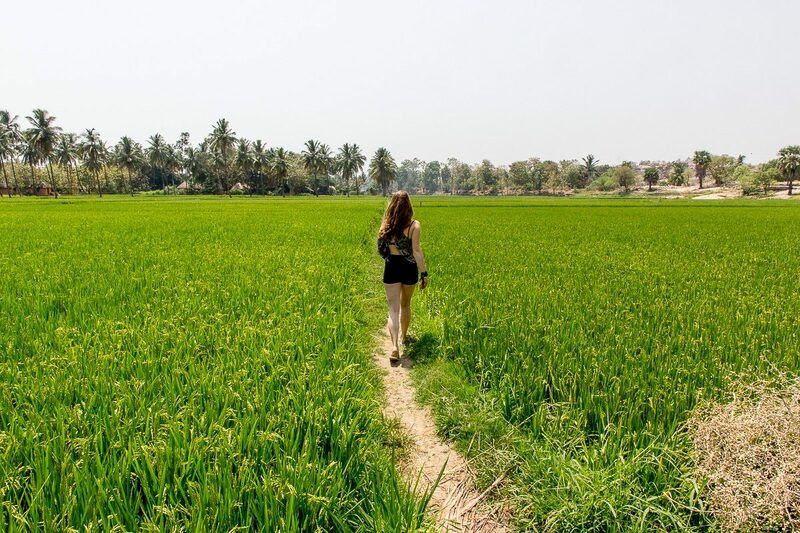 Stroll around the area of Hampi’s Hippie island to find the most beautiful rice fields yourself. A rough 1600 monuments, spread out over an area of roughly 40 square kilometers make up for the UNESCO World Heritage Site. 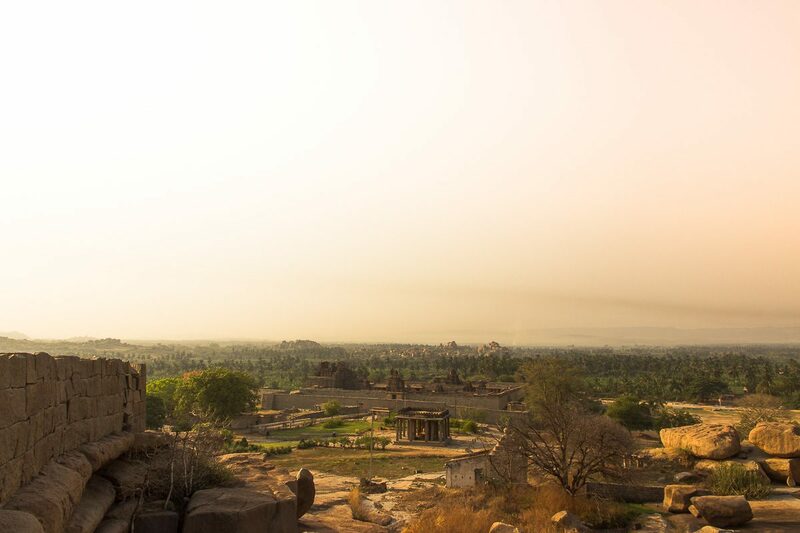 Visiting the temples is on the top of many travelers list when visiting Hampi, and to be fair, with over 1600 monuments it is quite hard to not even see one of them! The easiest way to visit some of the beautiful temples and monument is by going on a tuktuk tour, where the driver will take you to the most beautiful sights, as it will be hard to see them all during your visit. 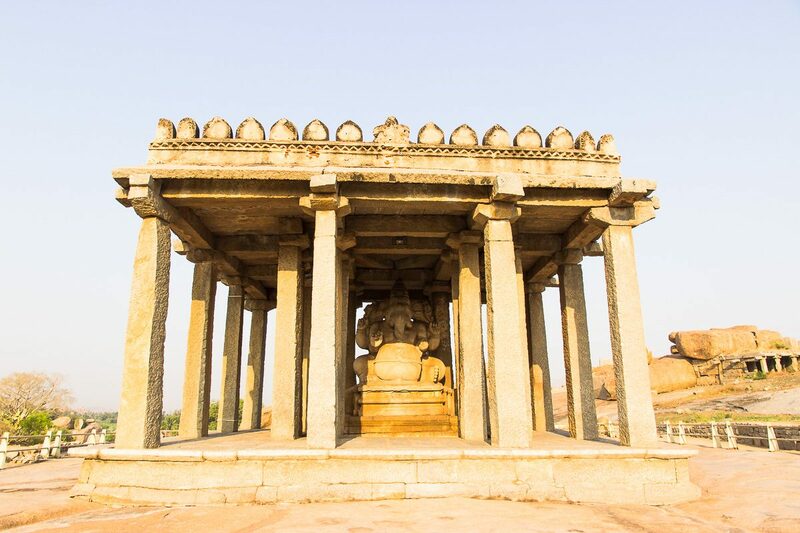 Spend half a day awing at the stunning architecture and learning more about Hampi’s history before continuing your journey through the rest of South India. Some of the most famous temples to see are the Virupaksha temple, Sasivekalu Ganesha monument (as seen in the photo below) and the Achyutaraya Temple. Our tip: start early in the day to avoid exploring in the mid day heat. While Hampi is the perfect place for adventure lovers and culture lovers, food lovers don’t have to worry, there is enough restaurants and street food stands to keep you busy for days. Head to the bazaar to eat at one of the many rooftop cafes and have a delicious veggie thali while enjoying the view over the river. Or perhaps try some idli from the street food stands early in the morning. If you are looking for the best breakfast try some dosa, a pancake made out of rice flour often coming with the most delicious chutneys! 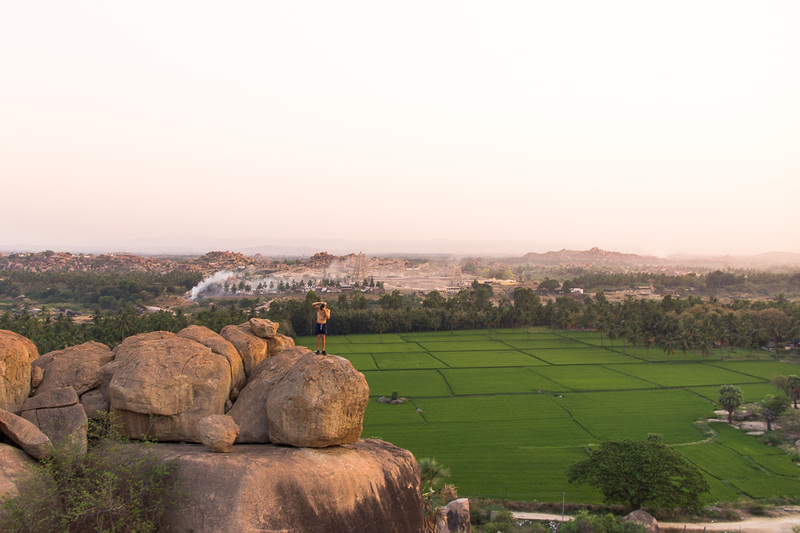 There is no secret that Hampi has some of the most beautiful natural sights, with these stunning boulder formations and green rice fields in between. However, the best sights can be seen out of Hampi and slightly further from the center of the island. 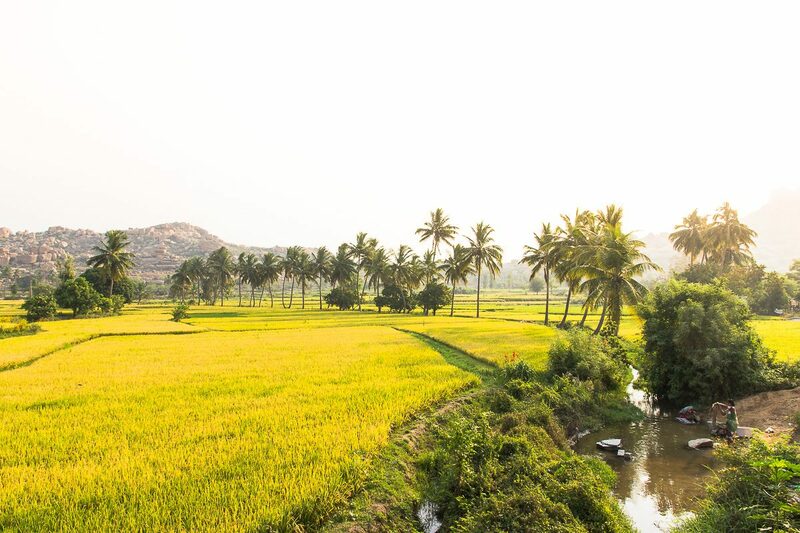 Rent a moped and drive through the most beautiful rice fields, through small villages and along the river to find the most quiet and serene spots of Hampi. 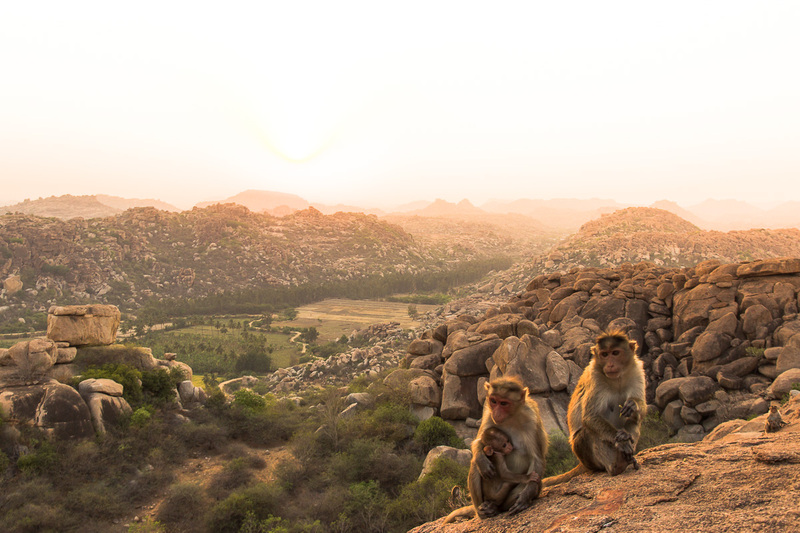 Escape the crowds of the Hanuman temple and climb the boulder formations to find your own beautiful viewpoint to enjoy the sun rise, or sun set for the not so early risers. 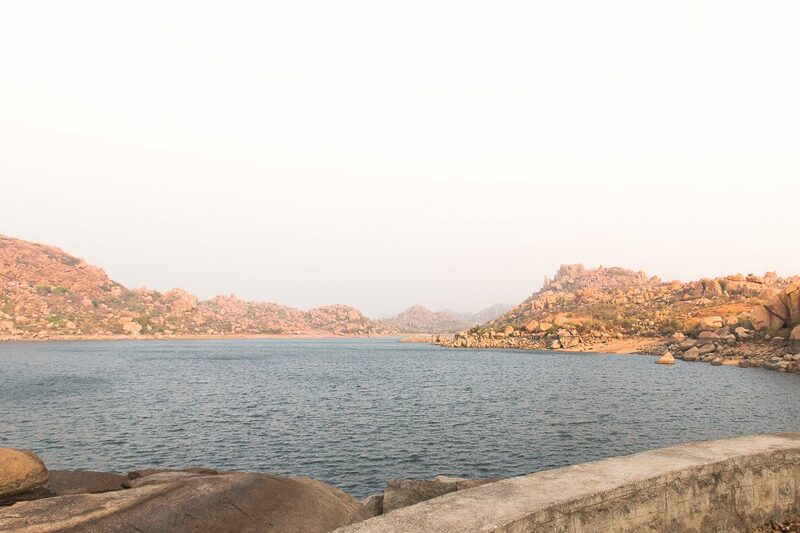 Riding around Hampi’s surroundings could easily keep you busy for a day, especially combined with some of the other things to do on this list! For the adventure lovers it doesn’t have to stay at just climbing the rock formations for the best viewpoints, they are also a great place to go bouldering. Hampi is a known place for rock climbers and boulders who stay here for days, if not weeks. The bouldering hotspots are all located at the Hampi Hippie island side of the river, so if you are planning on climbing or bouldering this is where you might want to stay. 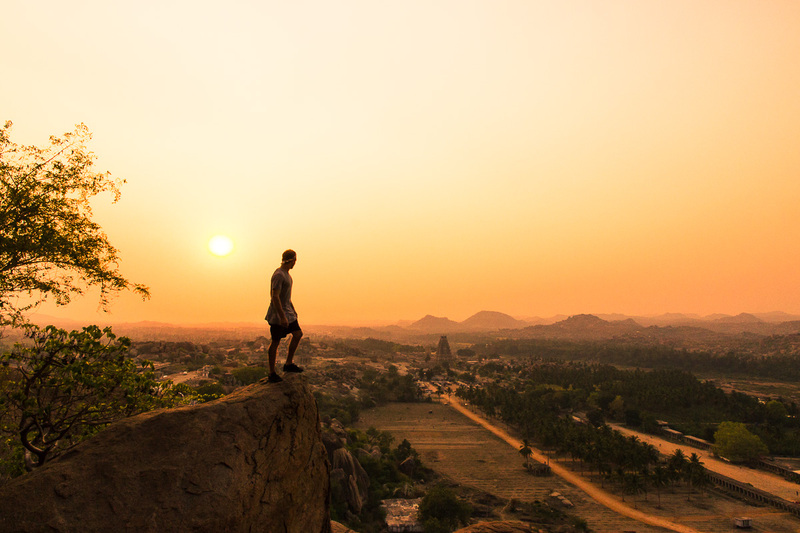 We have heard of various guesthouses and shops offering gear for rent, however, with Hampi being such a hotspot for bouldering you will find many travelers who will have brought their own gear. Temperatures can rise to easily above 40 degrees celsius during the warm months, and what better way to escape the heat then to go for a swim? There are various places to swim, one of the most famous with travelers being Sanapur Lake on hippie island. The easiest way to get here is by renting a scooter, then to park it in the shade and to simply enjoy the refreshing water. However, there are various warning signs to be careful of the crocodiles in the water, most people seem to be disregarding the warning and to be swimming for hours at the lake. Myth or reality? Swim at your own risk! Hampi’s bazaar might be small, but it’s still a good place to go shopping for some new clothes, jewelry or perhaps even camel leather bags. Wandering around the bazaar won’t take you long, but it’s a good excuse to make your way across the river, leaving hippie island, and exploring the temples around the bazaar as well. And you never know, you might actually find something that you like! 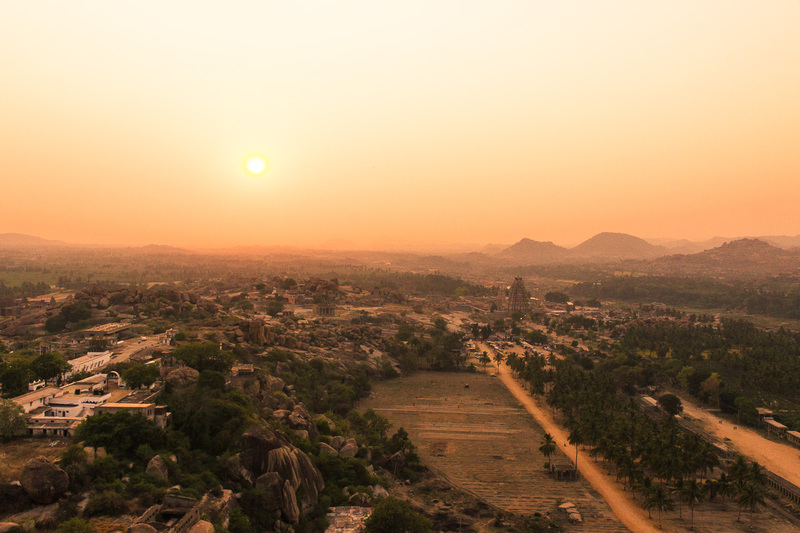 Even though the name says it all, Sunset point is an easy but beautiful climb to the top offering some of the best views in Hampi. On top of that, once you get there you’ll find loads of backpackers playing music, drinking tea, and enjoying the magnificent view. Sunset point offers a 360 degree view over the area, with the view facing the river most likely being the most magnificent. Surrounding hills, rice paddies, temples and the river, give this sunset point a beautiful range of colors. 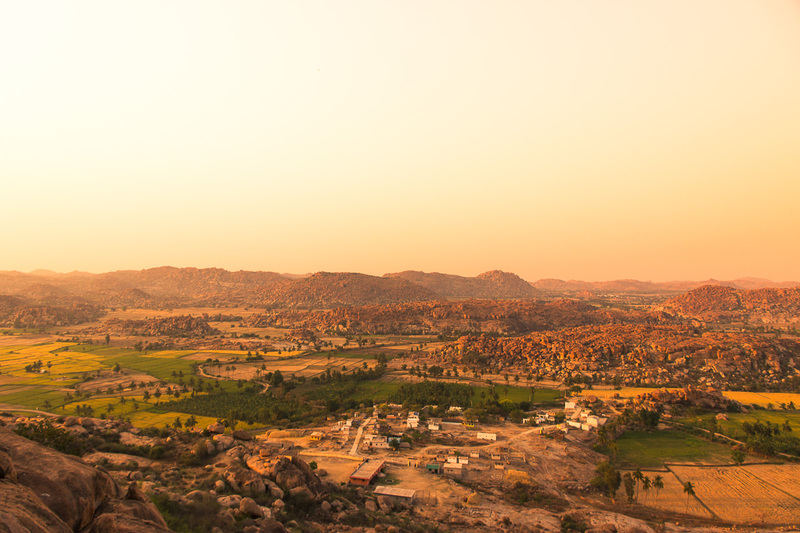 Sunset point is one of the most popular spots in Hampi for backpackers, and if you see the view below you might know why. The best thing about sunset point is that it is located within walking distance to some of the more popular guesthouses on Hippie island making it a quick and easy stop at the end of a long day of exploring Hampi. 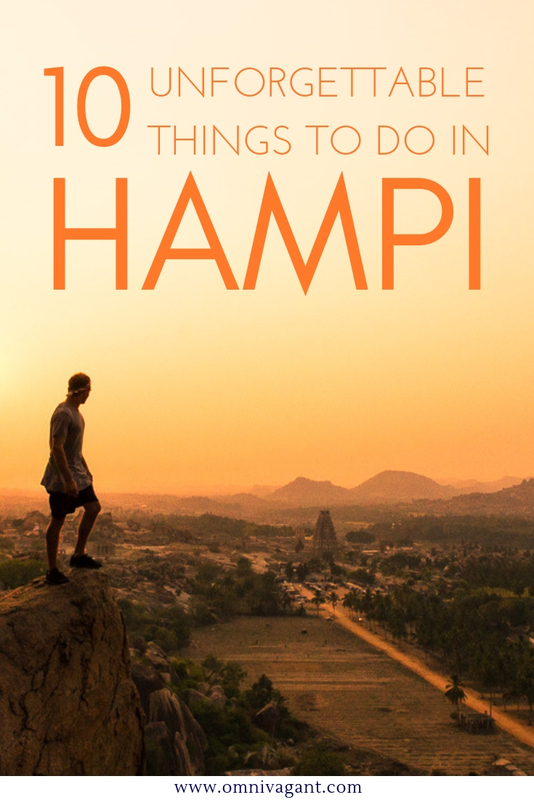 And there you have it, the 10 most unforgettable things to do in Hampi, for adventure junkies, culture lovers and foodies, Hampi is a backpacker’s paradise for everyone. 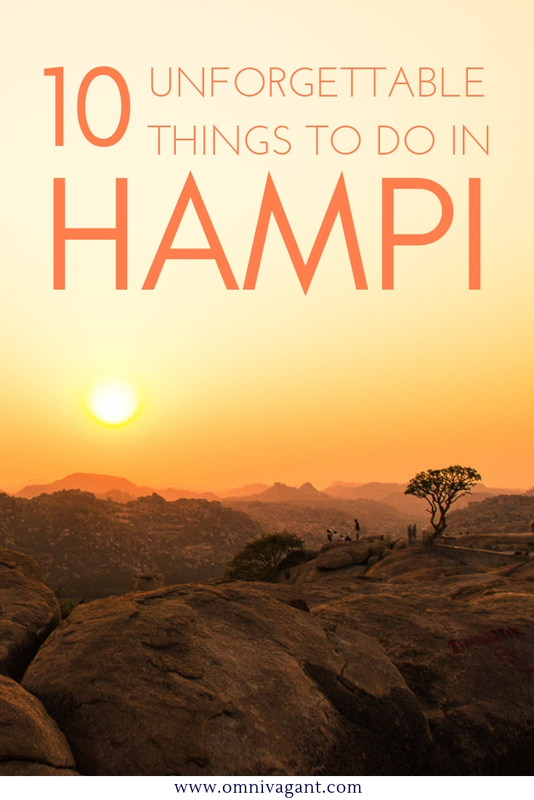 How about you, have you been to Hampi before? Anything that we have left of this list? Tell us in the comments down below! Oh, adn don’t forget to pin it!